The Chiddingfold Community Fund encourages local giving to develop a greater capacity to respond to village needs. The Fund enables people who love Chiddingfold to donate money for the exclusive benefit of the village and its people. With your help we can help build a stronger community by supporting local causes that can make impact and that will empower Chiddingfold to help itself now and in the future. 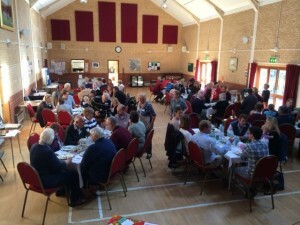 Why Support the Chiddingfold Community Fund? Chiddingfold Toddler Group meets every Tuesday morning during term time in Chiddingfold Baptist Church. The group is run by parents and the group provides play, crafts,snacks and a song-time for pre-schoolers. A grant provided new toys for the group in order to boost the groups attendance and therefore financial benefit in paying rent for the church, as well as improving the wellbeing and safety of the children. The groups aim to provide a warm friendly place for mums to meet and make friends and is a real lifeline to get mums in Chiddingfold out of the house with their children and socialising. St Mary’s Church aims to help those in the village of Chiddingfold in need and with limited funds. Funding was awarded for the implementation of garden fencing, to allow a severely autistic young man to play outside. This fencing significantly helped the son of one of the villagers in his ability to remain calm when seeing passers by, reducing his anxiety and improving his overall wellbeing. Download the Chiddingfold Small Grants Form here, to apply for a grant up to the value of £2,000. If you’re interested in leaving a legacy to Chiddingfold, further information can be found here. Don’t forget Gift Aid! Using Gift Aid means that for every pound you give, the Chiddingfold Community Fund will receive an extra 25p from HM Revenue & Customs, helping your donation go further.